Getting your message out in the form of an advert is not easy. What publication should you go in, how long should you advertise for, what size of advert is right, what budget should you spend and how can you stand out. 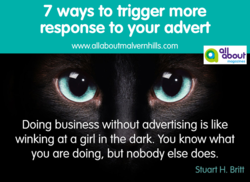 To answer all these questions I would probably need to write a few blogs, so this time I'd like to show you some tips on how to trigger more response to your advert. 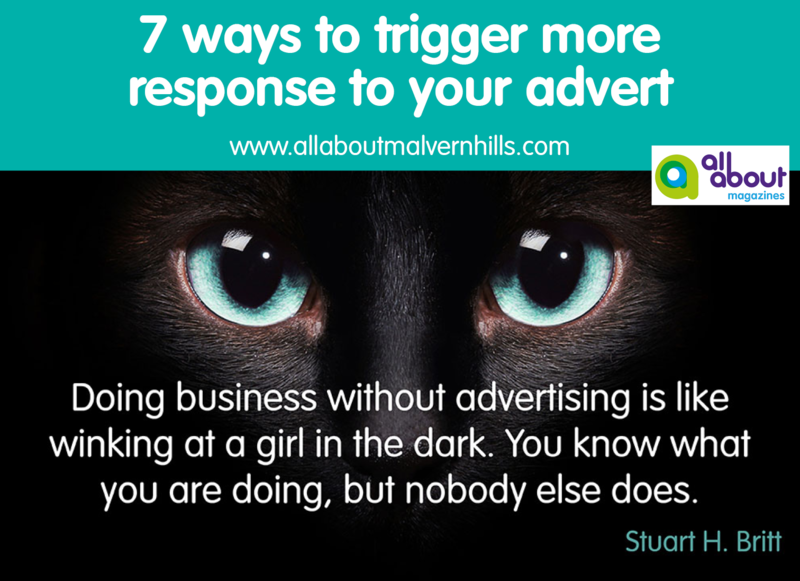 Don't apply them all in one go, but use them to think first before you start your advertising, and hopefully you can ask the right questions and come up with a strong message that will get people to pick up the phone or visit your website. Giving you these tips makes me smile a bit. If all my customers would apply all the tips, I would struggle putting my magazine together. I think you will see what I mean when you read through them. You will pay substantially more, but your advert will be seen. In my magazines (A5 size) the prime pages are reserved for full page adverts, which means they cover the whole page. The back page or front page (if possible, not all publications have a front page option) are the prime of them all. After that it is the inner front, page 3, page 5, centre pages or inner back. Did you know that some people read a magazine from front to back, but others read it from back to front? An alternative prime spot is the placement of your advert next to an article that relates to your business (for example a gardener next to an article about gardening). An editorial is a free article about your business, written by you or the editor, but the final say to the text is in the hands of the publication. It is sometimes given as part of a longer term commitment or you can ask for it when negotiating a deal. It will be a great exposure for your business, especially when starting your advertising campaign. Or, if you are a competent writer and have a lot of knowledge to share, you could offer to write regular articles of interest on your topic or expertise. Choose carefully what publication might be right for you. Will it reach the right audience? Send in an example of your writing with a kind request. And if it is relevant for the publication, they might be happy to place it. If it is not the right time, they might be willing to keep your details on file. You never know, worth giving it a try. An advertorial is a paid for space for you to fill with writing. For example a full page booked could be filled two thirds with an article and the rest with a banner advert for your business. Because you pay for the space you can fill it with what you want (subject to it being lawful and truthful of course). To give you an idea of how that might work; one of my advertisers is an osteopath. He writes an article about a different ailment, each time the magazine comes out. And it works for him, for years now. It pays off to invest in a graphic designer to design you a top notch advert and/or house style. It does portray your business in a professional way and will increase the chance of standing out in the crowd. If you start with a question on your advert, relevant to your ideal customer, it will increase the chance of attracting the attention. For example the question 'Do you need a website?' for web designers or 'Are you suffering from back ache? for a massage therapist. You can alter the question according to the season or what service or product you would like to put in the spotlight. If you don't know where to start, research other adverts in any publication you come across, and learn from what others do. Does it stand out and why? How can you use that idea for your advert? To get people to contact you and to try your service you could consider using an enticing offer. Not 5% or 10% off, but something really substantial that gets noticed. For example 50% off a first visit (for new customers only) or two for the price of one, or 25% off - make sure the offer is something you can afford, something that gets people to try your service or product. But remember, make sure you measure the response to know if the offer works. You could use a specific code or ask people to mention the publication where they found the offer. I could continue to write and give you even more ideas, but I think this is plenty to be getting on with. Remember, advertising is all about building trust and raising your profile. Little and often could be the way forward if your budget is limited. Think carefully when you are tempted to put all your eggs in one basket - don't blow your whole marketing budget on one large exposure with a very short shelf life. A great example where little and often works well is in community magazines. Our 4 magazines in the Malvern Hills and Worcester area are distributed locally for free, are full of local articles, events and businesses, are read and kept for reference until the next one gets delivered. A great way to get your message out to local people! Below you can download a sheet with a summary of the tips. Feel free to ask any questions or see how we can help you get your message out locally by calling 01684 252242 or drop me a line Sascha@allabout-local.com. I look forward to hearing from you.